Wednesday November 7th, 2018 Wednesday November 7th, 2018 ecosostenibile	0 Comments ¿Qué es el perianto?, Cosa è il Perianzio?, What is Perianth? The perianth (from the Greek perianthos comp from peri-, around, and anthos, flower) is the portion of the flower composed of the whole of the chalice and the corolla; or more external flowering verticilli when these are morphologically distinct. Perianth constitutes the non-reproductive part of the flower. 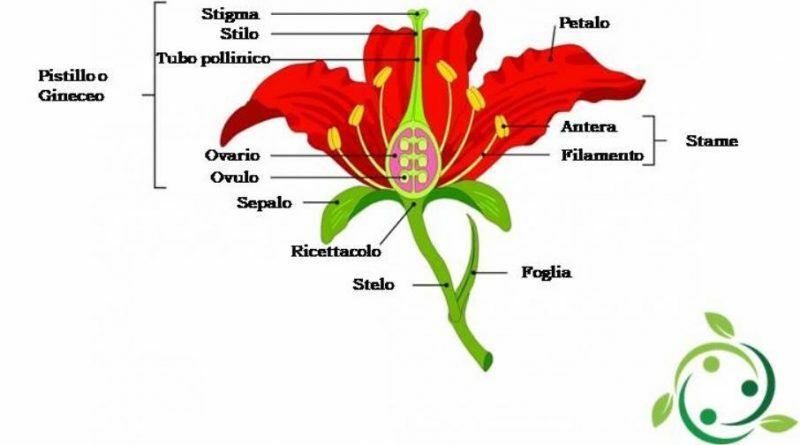 – from the glass, which is the most external and green part of the flower, with a more robust and protective consistency than the corolla and consists of sepals. – from the corolla, made up of the petals which are the colored parts of the flowers, having the function of attracting insects and small pollinating animals. • Aclamidated (or naked) when it lacks the chalice and the corolla, that is of the perianth or of the perigonium (like euphorbia, willow, ash). – Diclamidate if it has both verticilli (perianth). On the contrary, when all perianial leaves are unequal, the flower is called heteroclamide. In this case the verticill (or the verticilli) more external, are called sepals and go to make up the glass. When all perianial leaves (as is common in monocotyledonous) are not very different in shape, color and function, the perianth takes the name of perigonium, and the individual pieces of the perianth that of tepals. Depending on its shape and its color, the perigonium may take on a corolline appearance (petaloid tepals) or a calytic appearance (sepaloid tepals).